ideologee: Will the Sunday Assembly succeed? A while back Alain de Botton put out the call for Atheism 2.0 i.e. for atheists to get past the religion debate, and get on with building a more organised, communal and educational movement that helps people to live more fulfilled lifes. Amen to that, so to speak. We do need to be much better at helping people to live without religion. 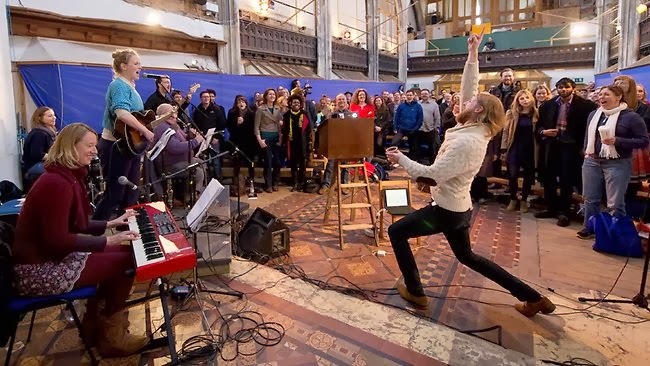 So, along those lines, The Sunday Assembly sprang into existence in London. It was started by two comedians. From the videos I've seen online, it's kind-of like a church service, except they sing pop songs and have some expert or artist talk about some facet of life. But the vibe is much more energetic and emotional and alive than most church services. It aims to be "a celebration of life". It's not really my scene, but I think generally it's a good attempt at building non-religious community. The two comedians are likeable and funny. So, I was interested to see how the group would go. Well, two tweets and the shark is jumped, in my opinion. I'm not going to embed the content because it's puke time. Click at your own discretion. Tweet 1 is "Radical inclusion in action..."
Tweet 2 is a link to this video (content warning: African in-your-face twerking, much worse that Miley Cyrus). So, they've failed the two critical tests: civility and homogeneity. I can't see the group having mass appeal, but nonetheless it was an interesting experiment to watch. An organised and communal movement is definitely what is needed for non-believers but for a group to be attractive and successful it needs to be cohesive/homogeneous and civilised. Diversity and indecency ruin everything.